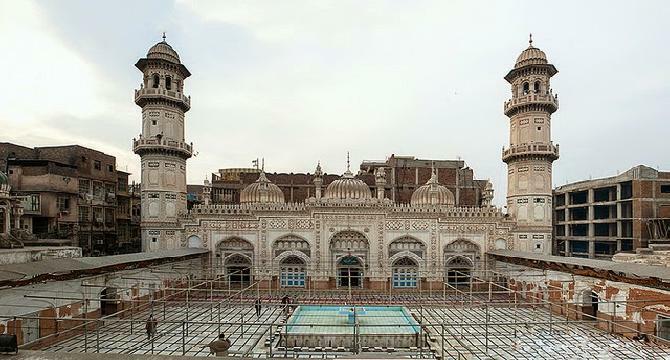 Mahabat Khan Mosque is a seventeenth century mosque situated in Peshawar, Khyber Pakhtunkhwa province, Pakistan. The mosque's name was proposed on the name of minister of Peshawar Mahabat Khan during mughal period. Nawab Mahabat Khan was the grandson of Nawab Dadan Khan who was the previous minister of Lahore. Nawab Mahabat Khan worked under the supervision of mughal emperors Aurangzeb Aalamgir and Shah Jahan during mughal period. Common people often mispronounce mosque's name as Mohabbat (love) Khan mosque, but the real name of the mosque is 'Mahabat Khan Mosque' and it was also the real name of its founder Nawab Mahabat Khan. The mosque was built in 1630. There is pond for wuzu in center of the main yard of the mosque. A long string of rooms is there along side the inner boundary wall of the mosque.Two high minarets are stood on both sides of the main entrance of prayer hall.History of Khyber Pakhtunkhwa revealed that these minarets were used to hang up the prisoners in Sikh times. Above the main prayer hall there are three beautiful domes painted with floral and geometric designs.